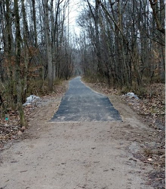 The Fairfax County Park Authority has been working on improvements to the Gerry Connolly Cross County Trail. Work was recently completed on a 1-mile long section through Accotink Park (green line on map) that includes a new bridge and pavement from just north of Accotink Lake to the Braddock Rd. underpass. 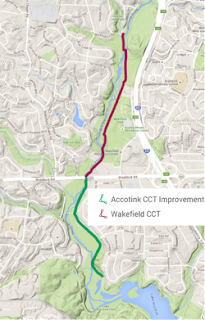 The Park Authority has also proposed trail improvements, including pavement for ~1.5 miles of the CCT through Wakefield Park (red line) that would create a paved surface trail from the new Accotink section at the Braddock Rd. underpass all the way to Accotink Pkwy on the north side of Wakefield Park. No time line is currently available on the Wakefield portion of the trail until the Park Authority can decide on adjustments to meet public concerns about the project that arose during a public meeting in October 2015. The improvements to the CCT in Accotink Park include new culverts, paved trail, concrete sections where flooding occurs, and a new bridge just South of Braddock Rd. Work began in early October and the trail opened again to traffic by 14 December 2015. The following photos are of the newly completed section in Accotink Park. section of the Cross County Trail, just past the Northern tip of Accotink Lake. flooding occurs along Accotink Creek just north of Accotink Lake. the new bridge and the Braddock Rd. underpass. Wakefield Park CCT Trail Improvements are Currently Stalled. The Park Authority held a public meeting on 15 October 2015 where they received significant opposition to the proposed trail improvements at Wakefield Park. Opposition came from the mountain biking community and local residents with concerns about increased impervious surface area adding to storm runoff and stream impairment. Wakefield contains over 20 miles of natural surface biking trails, and the proposal is to pave only the main trail, with around 1.5 miles of trail through the park. Park Authority staff will reconvene early in 2016 to assess how to adjust the project to help address public concerns. The park had proposed the project, in part, in order to reduce the recurring maintenance costs of the natural and gravel surface of much of the CCT through Wakefield Park, as a paved trail has little annual maintenance cost. 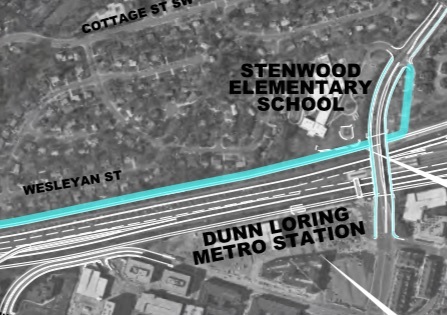 The project is to be funded partially by FCDOT, as the trail corridor is listed as a bicycle transportation corridor, and partially from funds from the 2012 County Bond Program. Questions or comments about the Wakefield CCT project can be directed to the project manager, Bill Boston at 703-324-2710 or William.boston@fairfaxcounty.gov. The Post article In Maryland, a how-to guide for saving an office park looks at the problem of office vacancies in suburban office parks in Virginia and Maryland. With vacant office space beginning to drain local tax coffers, officials in the Maryland and Virginia suburbs have trained their sights on their distressed office parks with an eye on reinventing them. Among the more radical ideas are turning obsolete buildings into schools or warehouses. But with the help of a panel of private sector experts, Montgomery County planners recently recommended a series of more incremental improvements for two isolated complexes, Rock Spring and Executive Boulevard, that may provide a playbook for turning such places into locations companies would be interested in leasing again. Some of the buildings along Executive Boulevard may ultimately be transformed into apartment buildings or hotels, as developers have done to buildings in Wheaton, Silver Spring and other parts of the county. But the panel recommended a series of quicker, less-expensive options, among them adding new signage, bike lanes, bike-sharing stations and turning the lawns and landscaped areas into more accessible park space. "Team D-Rock," as Kathleen and Dave call their family of bicycle enthusiasts, lives in Falls Church and stopped by the local Bike to Work Day 2015 pit stop to show their support for better bicycling in Fairfax. 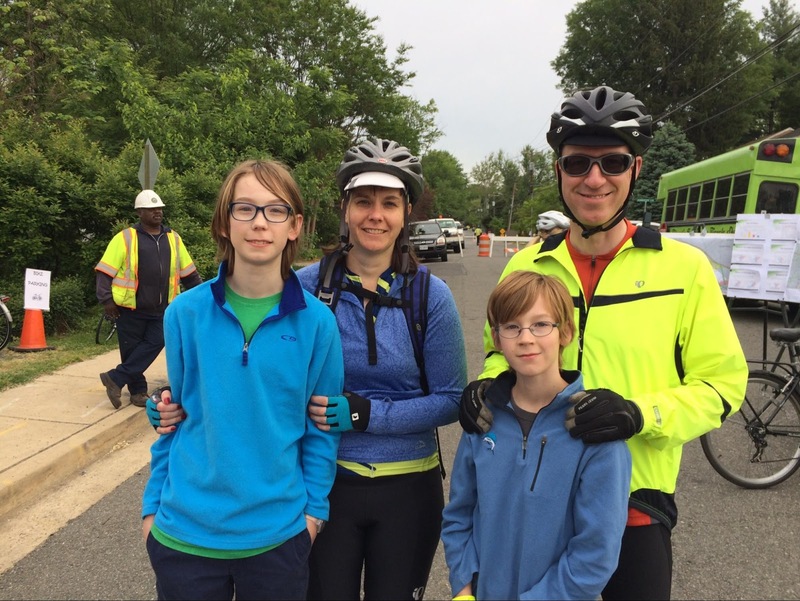 Kathleen and Dave told FABB that they regularly commute by bike to their jobs in Tysons and Vienna while their children ride bikes to school. Team D-Rock is a family that loves to ride! 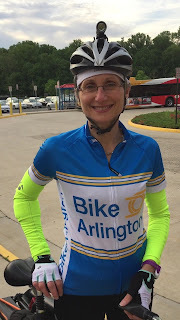 FABB had another busy and productive year promoting bicycling in Fairfax County in 2015. 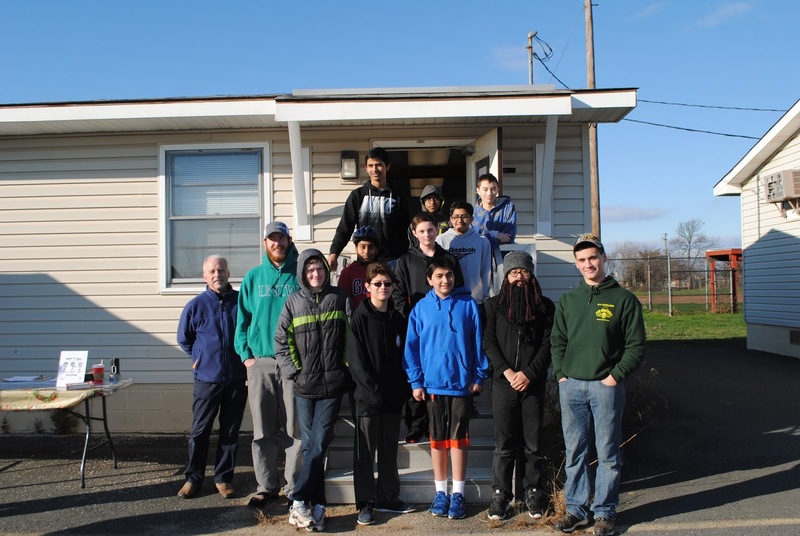 Please consider helping us out with a tax-deductible end-of-year donation to FABB to support our work in 2016. Thanks to everyone who has already made a donation. Below is a summary of major bike-related milestones during the past year. FABB led the effort to ensure that a trail parallel to I-66 was included as part of the I-66 Outside the Beltway Project. More than 480 cyclists wrote to VDOT asking that the trail be included in response to our appeal. Thank you and thanks to WABA for their help. FABB reps attended the many I-66 public meetings and spoke in support of the trail. We also met with VDOT and county staff and hosted a larger meeting of I-66 project reps to share our ideas and concerns. We plan to continue to be vigilant over the coming months and years to ensure that bike facilities are an integral part of the project. After months of searching, in November, Fairfax County named Adam Lind as the new Bicycle Program Manager, commonly referred to as the Bike Coordinator. Adam served as the acting Bike Coordinator after Charlie Strunk, who became the county's first bike coordinator in 2006, retired in January. On Charlie's last day with the county, the Board of Supervisors renamed the Wiehle-Reston East bike room in his honor. The Fairfax County Board of Supervisors in September approved the Transportation Demand Management Plan 2016-2021, which includes recommendations for funding a new "Bicycle and Pedestrian Coordinator." This position is intended to conduct encouragement and education programs, as recommended in the Bicycle Master Plan, which will complement the existing Bicycle Coordinator and Pedestrian Coordinator positions who focus on the development of infrastructure projects. 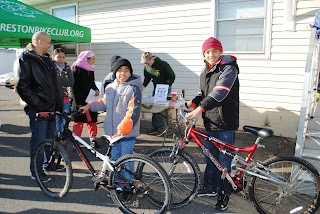 Bike to School Day in May was a huge success in Fairfax County where 54 schools participated. Many schools met the 100 or more bikers challenge and 7 schools participated for the first time. 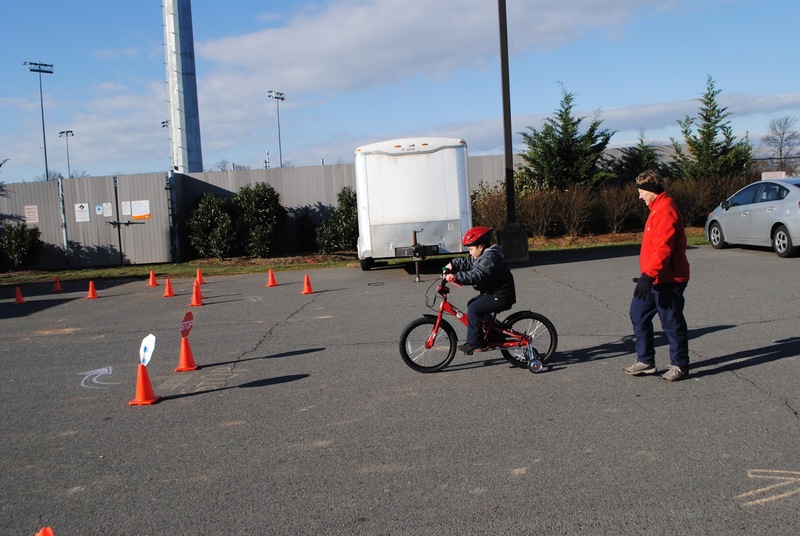 The Fairfax County Safe Routes to School (SRTS) Coordinator conducted bike safety classes at 15 elementary schools. Also, Fairfax County Public Schools (FCPS), using SRTS grant funds, purchased 30 bikes and 6 Strider no-pedal balance bikes for these classes. 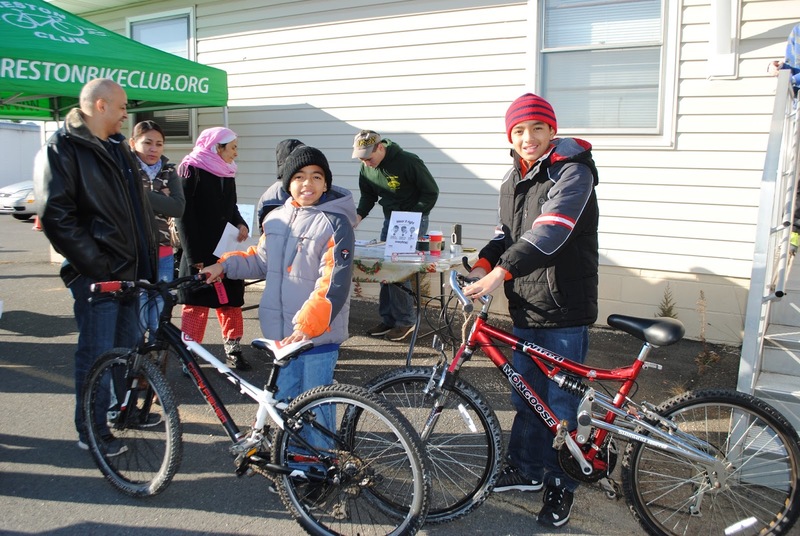 Additional grant funds will be used to purchase more bikes to expand the bike program to middle schools. FABB played a key role in getting the county to hire the SRTS coordinator who organized these projects. Plans to make Reston a part of Capital Bikeshare continued to progress this year. Fairfax County is applying for an additional $500,000 from the Transportation Alternatives Program (TAP) for capital equipment. 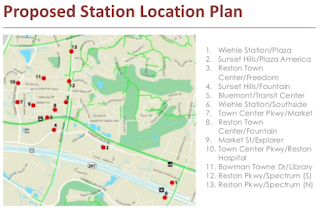 Fairfax’s plan calls for 130 bikes at 13 bike stations in and around Reston Town Center, the Plaza America Shopping Center, Reston Hospital Center, and the Wiehle-Reston East Metro station. Reston Bicycle Club's generous donation of a mobile bike counter, with help from FABB, enabled Fairfax County to begin to establish bicycle and pedestrian counts at locations around the county. Eventually the county hopes to have a network of counters to establish a baseline assessment of bicycle activity in Fairfax County and track the implementation and performance of the Bicycle Master Plan. Fairfax County’s updated economic strategic plan, adopted in March, emphasizes the creation of livable communities with expanded bike-pedestrian networks. The plan proposes funding for additional bicycle and pedestrian improvements and easements for new trails and park greenways in line with the Bicycle Master Plan recommendations. As it worked on several new road diet projects this summer, VDOT was recognized with a National Roadway Safety Award for the improvements achieved by its FABB-supported 2009 road diet project on Lawyers Road. A number of local projects and proposals impacted bicyclists this year. Projects included VDOT’s creation of more than 34 miles of new bike lanes in the county as part of this summer's repaving program, replacement of the rusted Van Dorn Street pedestrian bridge in Alexandria, and a new Rectangular Rapid Flash Beacon (RRFB) signal at the W&OD Trail/Cedar Lane intersection in Vienna. FABB participated in multiple meetings on the Rt. 7 Corridor Improvements Project which includes parallel multi-use trails between Reston and Tysons, and the previously mentioned bike facilities that are part of the I-66 widening project. In October, the Reston Association Board of Directors voted unanimously to work with Fairfax County to remove snow from county trails in Reston near the Wiehle-Reston East Metrorail station. Earlier in the year NOVA Parks began clearing snow from the 45 miles of the W&OD Trail. This will help transportation cyclists commute year round. Virginia’s legislators passed two bicycle-related laws that went into effect on July 1, 2015. The first prohibits motorists from following too closely behind another vehicle, including a bicycle, not just another "motor" vehicle. The second law allows a motorist to safely pass a bicyclist by crossing the solid yellow line. In September, FABB volunteers helped bring New Belgium Brewing Company’s Clips Beer and Film Tour to Reston Town Center for its inaugural Northern Virginia run. Proceeds from the event benefit FABB’s work in making Fairfax a better place to bike. Crowds of visitors got to try some of New Belgium’s more exotic beers while enjoying short films displayed on a large portable screen. FABB received help from The Bike Lane which provided bike valet service. The Fairfax County Federation of Citizens Associations awarded Bruce Wright a Citation of Merit as part of its annual Citizen of the Year program, which recognizes people whose voluntary contributions of time and talent enhance the quality of life of Fairfax County citizens. When asked what she would like to change to make it easier and safer to ride, Martha replied that more protected bike lanes on area roads would help. FABB continues to support efforts to implement the Fairfax County Bicycle Master Plan, which envisions the creation of more protected bike lanes and expanded visual cues that show cyclists how to share a lane, ride out of the door zone of parked cars, or move into buffered lanes only for bikes. 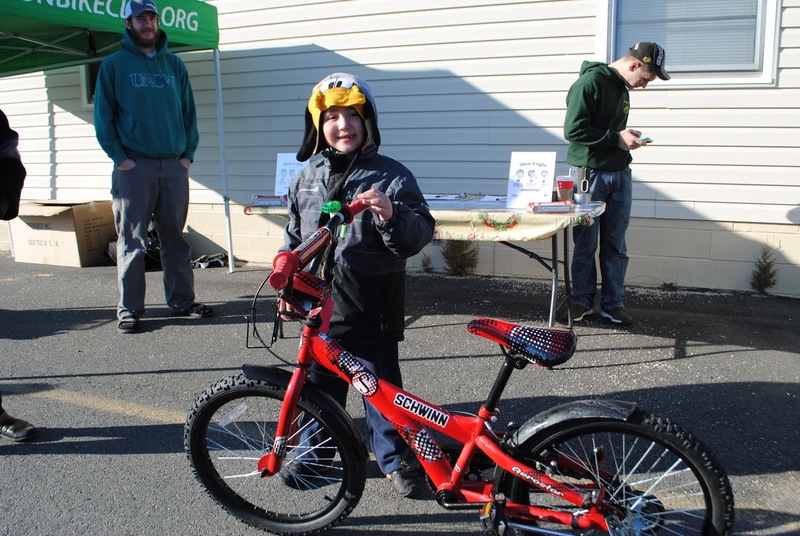 Local students participating in Herndon Middle School’s after-school bike shop program last Saturday gave away 22 bicycles that they had repaired and prepared for neighborhood children who might not otherwise have a bike. 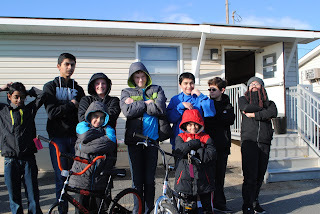 The chilly Saturday morning was warmed by the pleasure of the recipients and the satisfaction of the young bike mechanics. The after-school bike shop this fall was run by Kelley Westenhoff with assistance from mechanic Matt Meyer (Green Lizard Cycling), mechanic Aaron Morgan (A1 Cycling), and Reston Bike Club member Ed Robichaud. Other volunteers included Pete Fox and Ken Thompson. The students turned bikes donated by the community into “nearly new” condition with a combination of repair and cleaning. 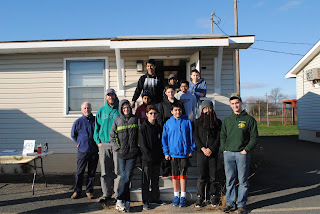 The students gained valuable bicycle maintenance and repair skills along with an appreciation for--and sense of accomplishment from--doing something for others. Reston Bike Club helmet station. 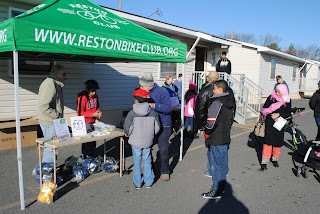 Reston Bike Club provided free helmets for the children whose parents brought them to HMS on Saturday for the giveaway. Sally Smallwood, Fairfax County Public Schools Safe Routes to School coordinator, was on hand to run the new riders through a bike safety course, ensuring they start their biking journey with a better understanding of bike control and safety principles. New rider learning the "ropes"
of bike control and safety. During the coming spring semester in 2016 the students in the HMS bike shop plan to repair and restore even more bicycles with the goal of selling them to raise funds to support the program. Happy owner of bike refurbished by HMS Bike Shop. Bike Shop members and friends. Cyclists outside Arlington National Cemetery. The Holden family expressed their sincere thanks to everyone who participated in the ride to honor fellow cyclist and retired Navy SEAL, CAPT Tim Holden. Ride organizer Tom Craver also expressed his thanks to the riders and to the DC Metropolitan Police Department--and especially Assistant Chief Patrick A. Burke--for their support. Although a sad and solemn ceremony, the ride was a great expression of the cycling community's concern for safer streets. For a bike cam view of the tribute ride, check out Jeff Anderson’s video. FABB members were among the hundreds of area cyclists who paid their respects to fellow biker and retired Navy SEAL, CAPT Tim Holden, on Friday, 18 December. 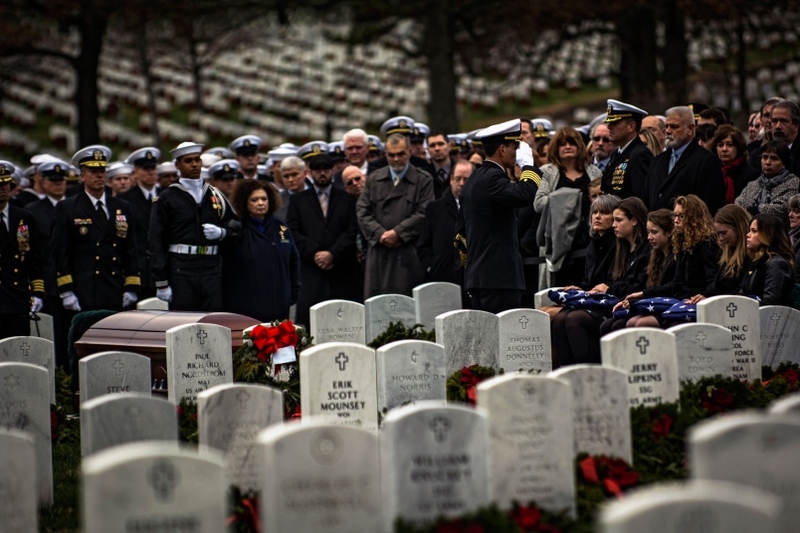 At the Holden family’s invitation, area cyclists joined Holden for his final ride and led the hearse across Memorial Bridge and into Arlington National Cemetery. 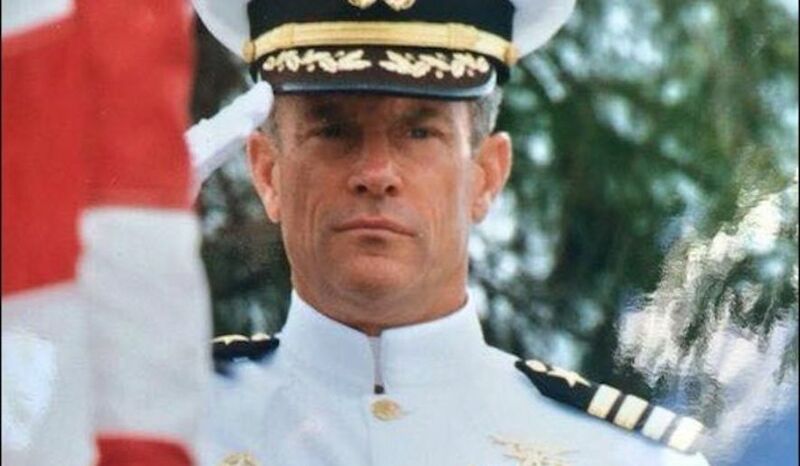 Holden, a US Naval Academy graduate, was a legend in the SEAL community and was the first American to enter Kuwait City during Operation Desert Storm in 1991. A 64-year-old grandfather, who left behind a wife, five daughters, and three grandchildren, Holden also was a passionate cyclist, according to friends who organized the tribute. Memorial Bridge to Arlington National Cemetery. Holden was killed in late August while riding to meet his daughter for coffee. Despite riding properly and with safety gear on Massachusetts Avenue in Bethesda, he was struck from behind by a drowsy driver who swerved into Holden. The motorist was only charged with negligent driving and paid a fine of just $690, according to news reports. In addition to paying tribute to Holden, ride leaders expressed the hope that the region's law enforcement and the larger community would get the messages about the dangers of distracted driving and the need for more equitable consequences for motorists who negligently take the life of or injure a cyclist. FABB continues its efforts to work with local leaders and law enforcement to achieve these goals in Fairfax County. 200 to 300 riders at the tribute. Join FABB for our annual Holiday Celebration tonight. Nothing fancy; a few light snacks, apple cider, and a chance to socialize with FABB regulars. In place of our monthly meeting we're having a small celebration, a short meeting to update folks on current topics, and then a short walk in the Mosaic District to discuss bike access and parking. The meeting is at 7:30 p.m. at the Mosaic Community Space, a meeting room in the Mosaic District around the corner from DGS Deli, near the intersection of Merrifield Town Center and Merrifield Cinema Dr. Here's a map of the approximate location. If you have questions you can send me a note or call at 703-328-9619. Kevin from Reston showed his support for Bike to Work Day by stopping by the Wiehle-Reston East Metro pit stop and took some time to talk to FABB. 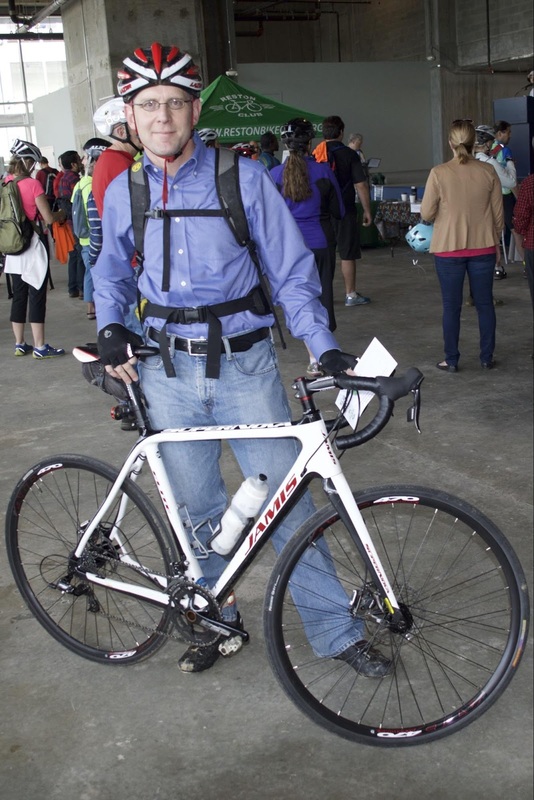 Kevin described biking as an “indispensable part of my lifestyle.” In addition to commuting by bike, Kevin rides throughout northern Virginia, saying that he enjoys the freedom he gets from biking and that he likes that his biking is good for the environment. 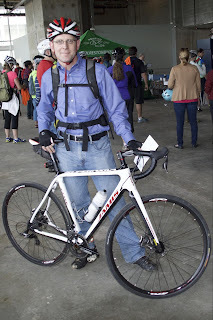 Like many area bicyclists, Kevin would like to see Fairfax County develop better road sharing infrastructure. FABB notes that Kevin rides to work in regular clothes and commutes for only a short distance. He is a great demonstration of a couple of points FABB regularly tries to make as its encourages people to bike: 1) you don’t need special gear to use your bike for short trips and 2) saying “I live too close to work to ride” is a really poor excuse not to use your bike. At their December 8 meeting the Fairfax County Board of Supervisors approved $22 million in pedestrian and bicycle projects around the Reston and Herndon Metrorail stations. The full list of projects contains some major bike improvements, including $8,000,000 for bike lanes and a shared use path along Sunrise Valley Drive and $1,000,000 for Bikeshare in Reston. This is a major commitment by the Board of Supervisors to improving bicycle and pedestrian access to the Silver Line stations in Reston and Herndon. Please consider thanking your Board member or Chairman Bulova, especially those of you who live in the Reston-Herndon area. The projects were recommended by the Herndon Metrorail Stations Access Management Study Advisory Group and the Reston Metrorail Access Group. FABB participated in both efforts. Sporting a lovely Bike Arlington jersey, Susan Demsko of West Springfield took a break from her morning commute to work to talk to FABB about her reasons for biking. Susan added that she also appreciates that biking rather than driving helps the environment and saves her family money by allowing them to avoid having to buy an additional car. 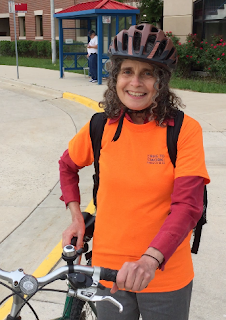 She would like for Fairfax County to add more bike lanes to area roads to make biking safer and easier. FABB has been advocating for construction of a trail parallel to I-66 outside the Beltway as part of the proposed widening project. The trail is included on the county Comprehensive Plan and has the support of the Board of Supervisors. With help from cyclists who have contacted VDOT, the trail is now included in the plans, but we are going to have to continue to speak out in support of this trail. On December 8 you will have an opportunity to speak to the Commonwealth Transportation Board (CTB) to support plans for extension of the Custis Trail I-66 outside the Beltway. The meeting will be held at George Mason High School, 7124 Leesburg Pike, Falls Church from 6-8 pm. Cyclists are encouraged to attend the meeting and sign up to speak in favor of the proposed parallel trail and bike facilities on the rebuilt bridges. Information about the meeting is posted on the Tranform66.org meetings page. See FABB's previous coverage of the project and info about our efforts to ensure that safe, convenient bike facilities are included. If the project goes forward, bicyclists should be able to travel safely along this congested corridor to commute and take short trips. The county Trails Plan and Bicycle Master Plan recommend including the parallel trail. There are also great opportunities to improve bicycle facilities through the Inside the Beltway project. Tolling of I-66 inside the Beltway would generate an estimated $10 million/year, funds that can be used for improvements to transit, bicycling, walking and other modes. Without strong support from the public for this plan, it could easily be jettisoned as there is strong opposition from legislators whose agenda is to widen 66 inside the Beltway. Great Falls Citizen's Association recently formed the Special Trails Committee to develop plans for a trail system in Great Falls. The committee recommended two types of trails, Primary Paths that would be asphalt multi-use trails and Secondary Trails that would be either asphalt or stone dust. In the past only stone dust trails have been endorsed by GFCA. The Countywide Trails Plan contains no paved Major Trails in the Great Falls Area. GFCA recently adopted a Resolution on Trails Surfaces that endorses the Special Trails Committee recommendations. This is a major step forward for Great Falls cyclists who prefer to ride on dedicated bike facilities. If you would like to help the Special Trails Committee as they continue to develop the Great Falls Trail Plan, contact Scott Knight. The Committee plans to begin to identify where the next sections of trail should be built. The western portion of Georgetown Pike will likely be first as it connects the Great Falls Village Center with Turner Farm Park, Utterback Store elementary school and surrounding parks and the most densely populated portions of Great Falls. Whereas, a portion of our community is in favor of Stone Dust where it may be a practical option for Primary Paths; and there is a ‘pilot project’ currently underway evaluating optimal stone dust construction (the “Georgetown Pike Phase II” path) that may find that Stone Dust construction is practicable in certain applications where Trailblazers is able to fund and staff ongoing maintenance. GFCA supports the ability to use asphalt (or similar hard surfaces where advisable) for Primary Trails (as defined above and as determined by the Special Trails Committee) in Great Falls, and shall work with Fairfax County as needed to allow such construction. GFCA maintains an open mind on the use of best-in-class stone dust construction for Primary Trail segments depending on the results of the Phase II path trial mentioned above, and where a stone dust surface can be shown to meet function, durability, maintenance and cost requirements, and where that surface will be properly maintained by a responsible party such as Trailblazers. GFCA continues to support stone dust or other soft surfaces for Secondary Trails that do not require the load capacity, multi-use capability, or durability of Primary Trails, being mostly intended for pedestrian (e.g. hiking) or equestrian use. However, GFCA is not opposed to asphalt on Secondary Trails where its use is advantageous over stone dust.